We stayed in this campground one night this summer on our way to the east coast. We were lucky as we didn’t have a reservation – The staff told us that this campground is popular in summer time as it has direct access to Lake Quachita. You can reserve a campsite via Reserve America. Crystal Springs is 20 miles west of Hot Springs, AR, via Hwy 270. We wanted to visit Hot Springs National Park and I was looking for a campground with showers (The campground at the National Park doesn’t have any), so this came up in our search. The drive from Hot Springs is about 40 minutes in usual traffic. The address is 1130 N. Crystal Springs Road Royal, AR 71968. The campground is right next to the lake and there a some very nice waterfront campsites. Book early if you want one of those. When we arrived we got the last available spot for a night which was in the second row but plenty of space for our Sprinter Van. The campsite had a table and a grill as well as water and shore power. Crystal Springs campground has a total of 76 sites – most with water and electricity. 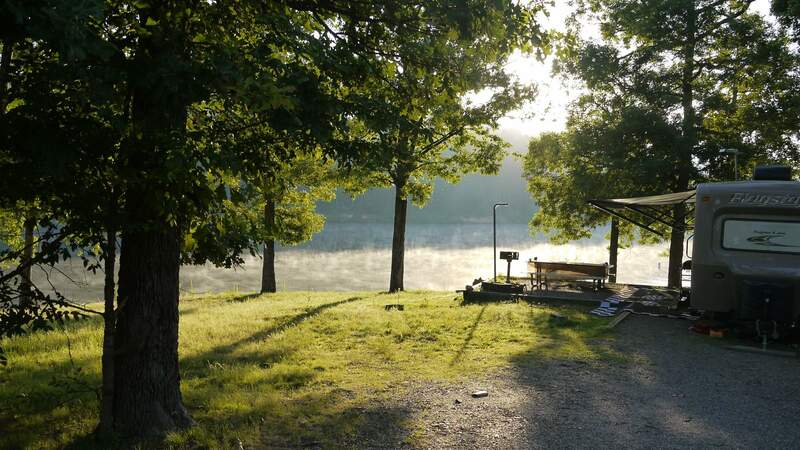 The definite plus of this campground is the location on the lake – it even has a beach. When we were there in June, the lake was lukewarm: perfect swimming temperature. Lake Quachita was built between 1946 and 1954 by the U.S. Army Corps of Engineers. I assume the campground was built a little bit later than that. You’ll find two bath houses with toilets and showers. They were clean but had seen better days due to age. There are some trails for hiking but most people probably stay at Crystal Springs Campground for fishing, boating or swimming. The staff was very friendly when we checked in and even gave us some background information about the area. Cheap – we paid $18 for one night.